2002 saw the 19th Winter Olympics in Salt Lake City, Utah. The European Union adopted the Euro as it’s official currency and went on to include ten new countries. The Mars Odyssey found signs of huge water ice deposits on Mars and a huge 660-pound meteorite explodes in a fireball over southern Bavaria. Kelly Clarkson won the first American Idol contest and Apple released its second-generation iPod (with an amazing 20GB of storage space). 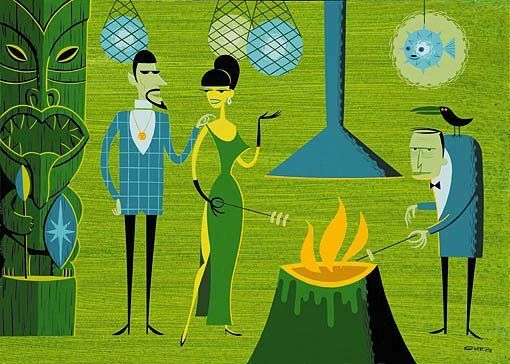 Queen Elizabeth II celebrated her golden jubilee, and in the light of these world events, Josh Agle took part in three group events. 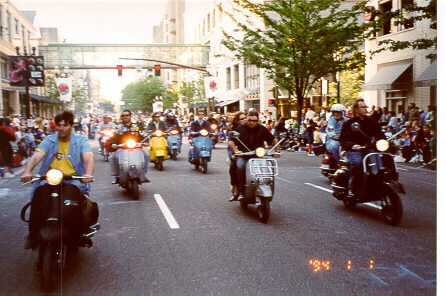 The 2002 Amerivespa rally in Portland, Oregon ran from the 29th May to the 2nd June 2002. 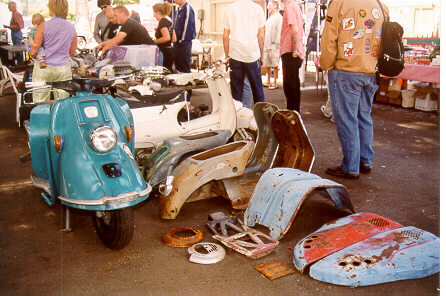 The four-day event includes over 450 scooters, and has rides, swap meets, a group meet, raffle, dinner, Concours d’Elegance and a parade. 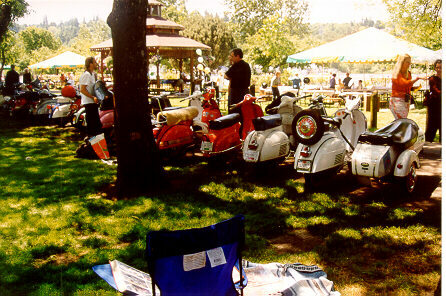 Shag produced a five-color serigraph print as a poster for the Vespa Club of America’s 2002 Amerivespa rally, measuring 33” by 40” and made in a limited edition of 100 copies plus 9 artist proofs. 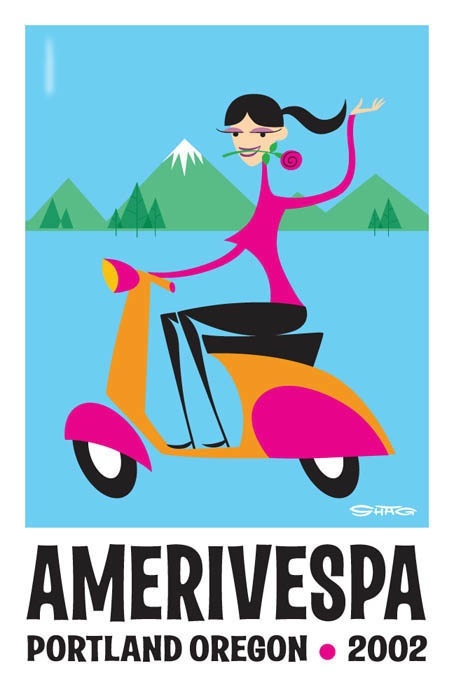 The Amerivespa print is on heavy paper stock with deckled edges. 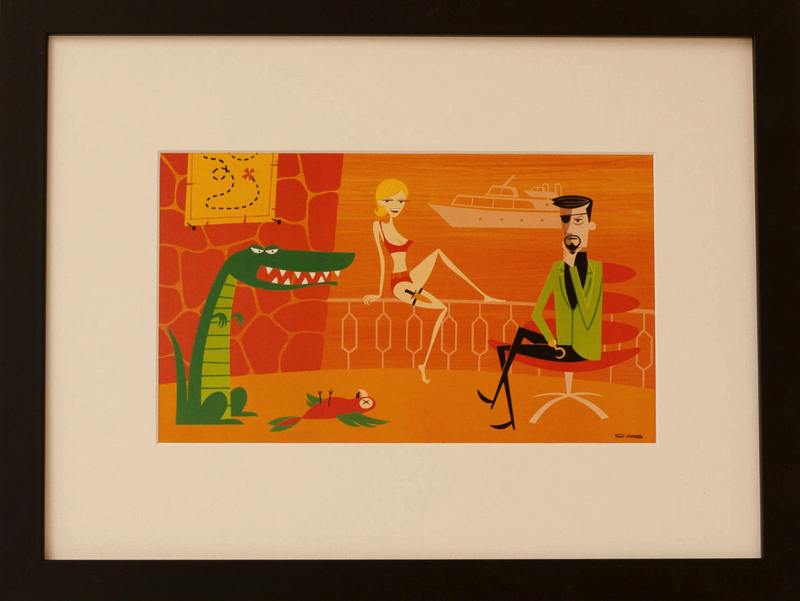 The print does not include a certificate of authenticity but is hand signed and numbered by Shag. 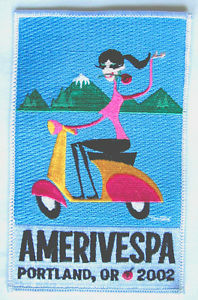 A Amerivespa Scooter Rally Patch was also produced measuring 6” by 3¾”. 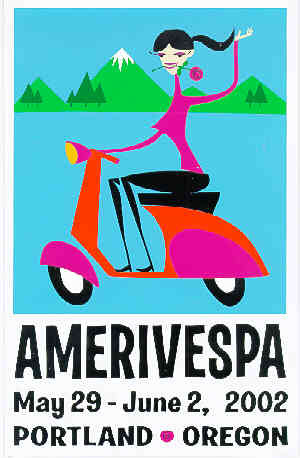 An Amerivespa magnet was also created. The 12 Years Of Fine Art Publishing group art exhibition was held at Copro/Nason Gallery in Culver City, California from the 26th October 2002. 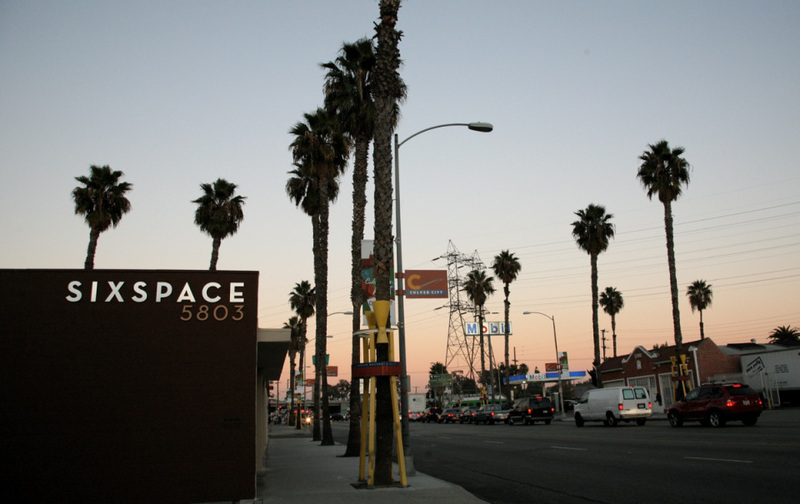 The opening reception was held from 9pm to 12am on Saturday 26th October 2002. 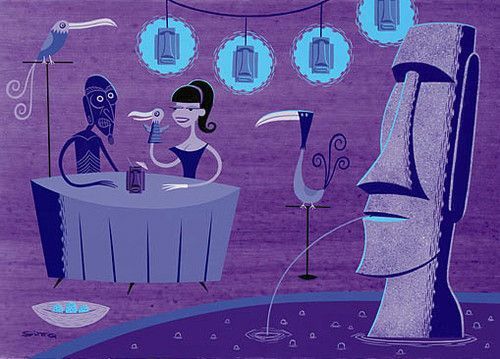 Shag showed several prints at the event with two of his original paintings, The Little Inferno and Kava Kava Man, being silently auctioned. 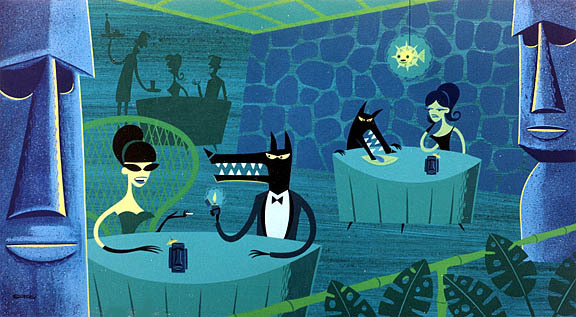 Shag also debuted two new prints, Envious Girlfriend and Death’s Unending Vacation at the show of over twenty artists. 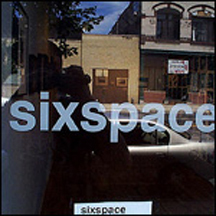 Caryn Coleman launched the SixSpace Gallery in Los Angeles, California in 2001 following success in Chicago. The gallery held the Pirate Booty: The Arrrt of Mates & Wenches exhibition from the 7th December 2002 to the 11th January 2003. 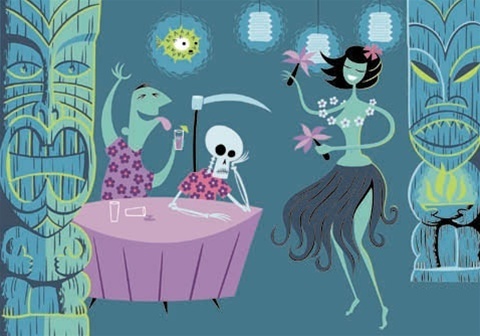 The show features pirate-themed works by the artists Josh Agle, Seonna Hong, Dave Cooper, Lynne Naylor, Tim Biskup, Paul Frank, Liz McGrath, Eric Bryan, Coop, and Camille Rose Garcia. An artists reception was held on Saturday 7th December 2002 from 7pm to 10pm. Shag contributed the original acrylic on panel painting La Costa Barbarossa which measures 26” by 15″ and sold during the event.